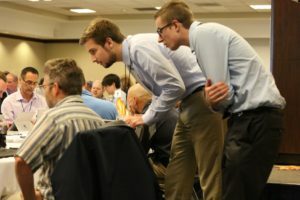 MiHINterns play an essential part in making our annual Connecting Michigan for Health conference a successful event. Interns at Michigan Health Information Network Shared Services (MiHIN), commonly called MiHINterns, provide a fresh perspective on healthcare issues and create innovative solutions that help MiHIN transform the healthcare industry. Interns are an essential part of the team at our growing, health IT nonprofit. MiHIN provides a high‐energy environment for a wide variety of talented people who are working to build a healthier future for the state of Michigan. Our interns are the most important people at MiHIN because they represent our future. We look for self-motivated, professional intern candidates who can work independently and aren’t afraid to ask questions. Interns may work up to 29 hours per week with the expectation of a minimum of 15 hours per week. All hours must be completed within our office hours Monday – Friday, 8 AM – 5 PM, with an hourly wage depending on education/experience. If you are ready to apply, then click here. MiHINterns represent a broad range of degree areas and develop excellent collaboration skills while working with others from diverse backgrounds. The MiHIN internship program accepts international students with up-to-date work authorization for off-campus employment. MiHIN recruits undergraduate and graduate students from many accredited colleges and universities. You must be an enrolled student for the duration of your internship, but your degree area is not a concern at MiHIN. Our main interest is your bright mind and your willingness to accomplish thoughtful, creative work. As a MiHINtern, you will be paired with a full-time team member to act as your mentor throughout your internship. You will collaborate with your mentor, other team members, and other MiHINterns on projects and presentations. High-performing interns are encouraged to stay with MiHIN for multiple semesters. Routinely communicate and track project status and work schedule to team members via emails, meetings, presentations, reports, etc. NOTE: If you have any questions about MiHIN’s intern program, or if you have any issues with using the form below, please feel free to email internship@mihin.org.